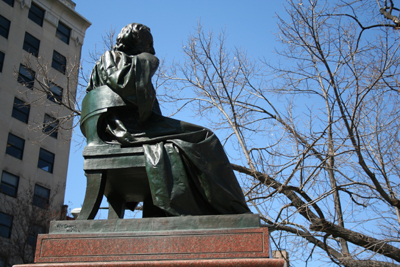 It took twelve years for the Longfellow National Memorial Association to erect a monument to Longfellow who was considered one of America’s greatest poets, and the first in Washington, D.C. to honor an American literary figure. In 1897 the Longfellow National Memorial Association was organized with Chief Justice Fuller as president. 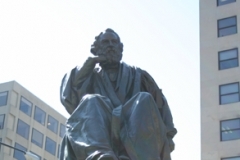 Congress gave the site of Connecticut Avenue and M Street/Rhode Island Avenue, for the statue and contributed $4,000 for the pedestal. The remainder of the $25,000 was raised by subscription. The dedication ceremony was held on May 7, 1909. Members of the diplomatic corps, descendants of Longfellow, and, standing in for President Taft, Attorney General Wickersham. Seats for 700 people were set-up on the Connecticut Avenue side of the park, and spectators filled the streets. The presentation of the statue was made by Brainard H. Warner, treasurer of the Memorial Association, and the acceptance on behalf of the nation was by Attorney General Wickersham. During the ceremony there was a series of flags surrounding the statue with titles of Longfellow’s poems. The Marine Corps band played and there were addresses on Longfellow’s life, his poetry, and his contribution as a citizen. 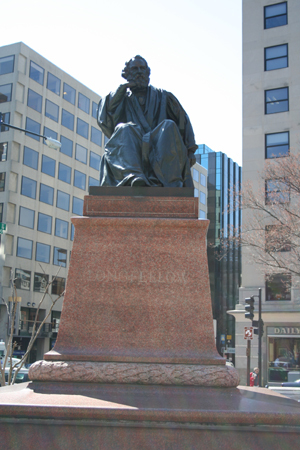 The statue was the first full-sized statue of Longfellow. 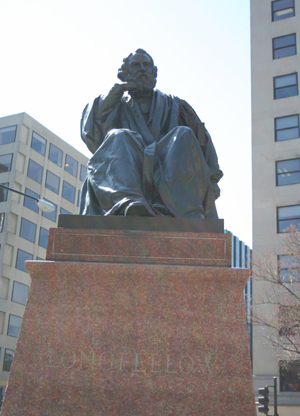 The statue represents Longfellow with a book in hand, and is placed on a block of Bonacord granite brought from Sweden and carved in Scotland. Chief Justice Fuller, of the United State Supreme Court, and then president of the Memorial Association, presided over the unveiling ceremony. Sail on, oh, Union, strong and great! In 1940 the 133rd anniversary of the birth of Henry Wadsworth Longfellow was observed with a ceremony at the statue’s triangle park. In 1967 the National Park Service redesigned the park to include sidewalks, a water foutain, and benches. In 1977 Metro initiated it’s Poetry and Art program – a display in Metro buses of 10,000 colored posters each showing illustrated verse – in front of the Longfellow statue.